When fishing in muddy or stained waters, as we’ll no doubt have more of this summer, it can help to have a lure with some sound or flash. Some lure manufacturers are made with ultraviolet colors that can attract fish from far away. One angler recently had luck on rainbow trout at Lower Lake Mary in Flagstaff using a Panther Martin FishSeeUv lure — one more trick for your tackle box. Summer nights made chill by spats of rain showers — this can be the time to fish in the high country of Arizona. Increased rainfall predicted for high country regions can also eventually favor anglers, bringing inflows and nutrients, and, in turn, baitfish and predatory fish. Target areas with recent inflows. Monsoon season is here so be safe. Get off the water if there’s lightning and if you get trapped on the water find a protected cove or small bay and wait out the storm. Submersible lights at night for stripers will be a great option if the weather is calm. Be sure to check the latest wind and weather forecasts. Anglers can fish in snow, ice, some heat (be safe) and rain – but keep those lightning (fishing) rods off the water. Overall, angling can be tough in this part of the summer, but be selective in your spot and time, and you might go away with a heavy stringer, or at least a camera full of memories. Grab a license online (that helps conserve all species of wildlife, not to mention provides funding that goes back into fishing opportunities) and go. Apache Lake on the Salt River chain of lakes is relatively undeveloped, and is an excellent fishery for bass and catfish. 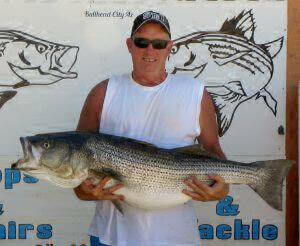 Fishing tournaments at Apache and Canyon Lakes can resume, effective immediately. Tournaments on Apache, Canyon and Saguaro lakes were temporarily suspended when golden alga blooms developed over large portions of the lakes. Saguaro Lake tournaments remain suspended. 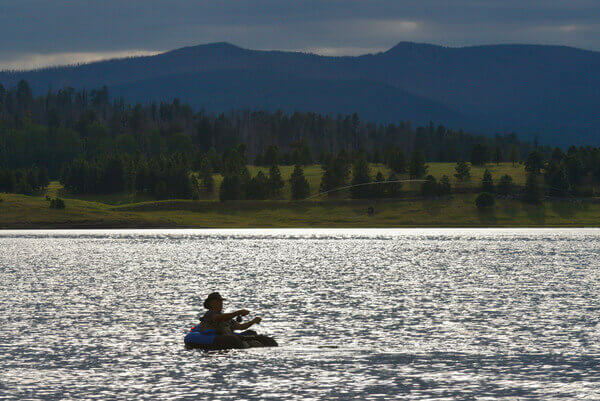 We reopened Cluff Ranch Pond #3 to recreational activities in mid July after it was closed in June for use by U.S. Forest Service crews to help suppress the Frye Fire. The Cluff Ranch Ponds are located in the Cluff Ranch Wildlife Area off Cluff Ranch Road at the base of the Pinaleno Mountains. 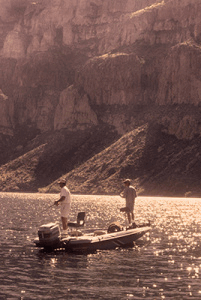 Send your fishing reports and photos to BFishing@AZGFD.gov — one will be selected as Catch of the Week. At press time, recent stockings (sign up for I Support Wildlife for real-time and confirmed stocking reports) were at the following: Fool Hollow Lake, Show Low Lake, Silver Creek, East Fork Black River, Little Colorado River-Greer, Christopher Creek, Canyon Creek, East Verde River, Haigler Creek, Tonto Creek, Willow Springs Lake, Woods Canyon Lake, Oak Creek, Goldwater Lake, and Rose Canyon Lake.